The Emperor himself later indicated his regret that he even gave Luther a safe conduct, and immediately put a new price on his head. As Luther was leaving the city, his friends staged a kidnapping to protect him and took him away in a fast horse through the forest. They hid him for a year in Wartburg at the castle disguised as a knight. During that year, Luther undertook the task of translating the Bible from the biblical languages into German. And that perhaps was his most important legacy of that time - that he made the Bible available to the common people. And with that the Reformation was born. 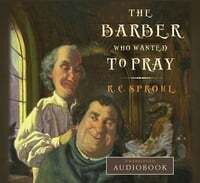 In honor of Reformation Day, we are making Dr. Sproul’s newest children’s audiobook, The Barber Who Wanted to Pray, available as a free download through Reformation Day (Oct. 31). You can also pre-order the CD version of this story or buy the hardcover illustrated children’s book published by our friends at Crossway. May you and your family benefit from this helpful resource on prayer.